Do Stackers Need to be Used on all Three Axles on Triple Axle Toy Hauler? 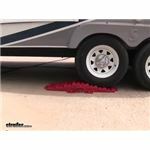 That's an interesting question, but leveling blocks such as # A10-0918 should be used on all three axles to properly support your toy hauler. Your axles each have a weight rating and you would not want to take one out of the equation entirely. 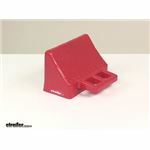 If you plan on using these blocks you can help keep your wheels in place with wheel chocks # A10-0922. I've added links to video reviews of each product for you to take a look at. The Stackers part # A10-0920 can be used under jacks/stabilizers but can also be used under the wheels of a vehicle to level. I attached a picture that shows this as well. 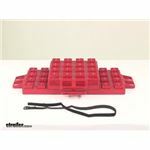 You are going to have to use your best judgement with the Stackers Leveling Blocks # A10-0920. 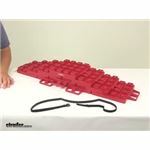 They don't have to be used strictly on paved surfaces but you also don't want to use them over a deep rut or on a steep incline. 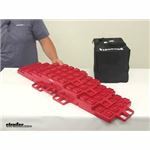 With the 10 blocks that come with the Stackers Multi-Use Wheel Supports # A10-0918 that you referenced the overall height max when using them with 4 pads is going to be right at 4-1/2 inches. I attached a picture that shows this used in that configuration. Yes, the Stackers Leveling Blocks # A10-0918 can be used under wheeled tongue jacks, stabilizers or 5th wheel landing gear to give you an instant height gain. 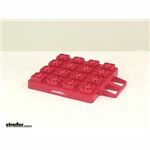 They also provide a larger footprint to help avoid jack feet from sinking into soft ground. Whether you are using just 1 or all 10 of the Stackers Leveling Blocks # A10-0918 the maximum capacity is 40,000 pounds. Are There Leveling Blocks Wider Than 8-1/4 Inches? Each of the leveling blocks we carry have a width between 8-1/4 inches, such as the Ultra-Fab # UF48-979052 you mentioned, and 8-1/2 inches, such as the Stackers # A10-0918. The Stackers have a 40,000 lbs gross vehicle weight capacity and can be used for scissor jacks, hydraulic jacks, fifth wheel jacks, and stabilizer jacks. 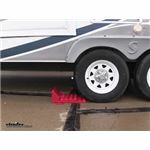 The Stackers Leveling Blocks for Trailers and RVs - 1-3/8" x 8-1/8" - Qty 4 # A10-0916 weigh approximately 4 lbs or just under 1 lb each. I've attached a couple review videos of this product to assist.